Built in 1804 & listed on the National Register in April 1993. Located on the Cape Road, off of Route 302. 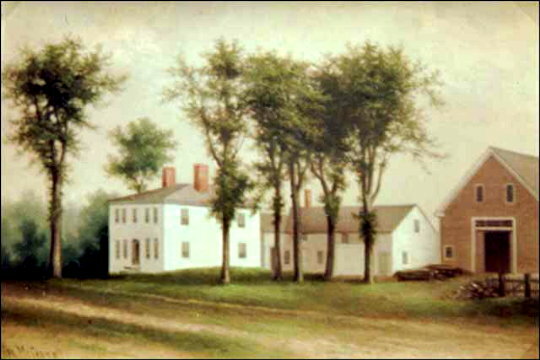 The Manning House was named after its first owner, Richard Manning—an uncle of American author, Nathaniel Hawthorne. The Manning House is almost identical to the nearby Hawthorne House, except for the roof—the Manning was built with a hip roof, while the Hawthorne was constructed with a Georgian roof. In 1871, Andrew & Mary Ann (Dingley) Libby resided in the Manning House. In the early 1900s, J. Frank & Grace E. (Watkins) Welch took boarders at the Manning House. Grace is said to have tired of all the comments made about the beautiful antiques in the Manning House and supposedly took a wheelbarrow full of the antiques and buried them in the nearby Manning Ballfield. The Manning House is privately owned.